I was watching "How the States got Their Shapes" and there was a very interesting part about how the roads got laid out in Boston originally. Very interesting stuff. starts at about the 30 minute mark, right after a commercial. My signature is a spot on quote by some famous guy. It took ten minutes of TV time to explain something that you can say in one sentence. Nice to see Fred Salvucci's still kicking around, though. That explanation is extremely incomplete. I've taken several classes and read several books regarding the developmental history of Boston, and cow pastures/walking paths aren't the only explanations. But I'm not going to get into it... I'm sure most of you know the history anyway. I would love to read your explanation. I'm not familiar with the history of the streets. I actually watched that whole episode. Some interesting info is shared, but they don't go too deeply. A lot of the info is vague or filler. I would love to read your explanation. As to the video, it being the History Channel I was worried for a minute that they'd accept the cow paths thing as truth. 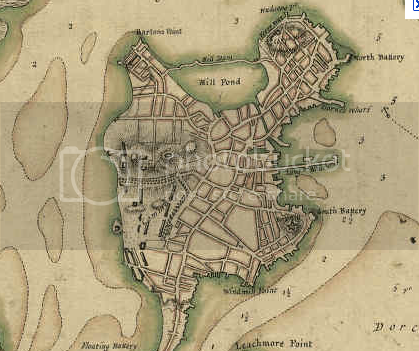 Having looked over the years at the succession of street maps from colonial times to the present, Boston's street pattern seems to have been shaped by the tidal lands, small original peninsula, hills, and creeks, and the gradual fillling and expanding of the land mass in bits and pieces over the centuries. Unlike lower Manhatten which was always pretty much there, Boston started out as a fraction of the land mass it currently is. This produced a patchwork of street and land additions, compared to Manhatten's more ordered system. I knew alot of Boston was fill but I never knew how much or that there was only one street in/out of the city. Looks like it was maybe Tremont or Washington St (used to be called Orange Street). Last edited by bosma; 05-22-2011 at 10:14 PM. What's now Washington Street was the only road into the city. The 'Neck' was around the intersection with today's Dover Street. Dover Street was renamed Berkeley to upgrade its image. This was prior to the gentrification/general clean-up that has since taken place in the SOWA (my use of that acronym should not imply that I like it) area. I don't think the Boston streets were really that crooked or unusual. And, as land was added, the streets were laid out in grids, just like everywhere else, on Beacon Hill, the South End, and, of course, the Back Bay. This is interesting to think about. To me it does seem to be true that in spite of how it feels, most streets are not very crooked and weird. Overall it seems like a patchwork of small street systems that make sense internally?the given examples of Beacon Hill, the South End, and the Back Bay are all more or less straightforward within each neighborhood. But the thoroughfares connecting the neighborhoods might go every which way, meeting in the confusing thousand-spoked "squares" around town, and including subtle (or not so subtle) turns that cause once parallel streets to end up intersecting each other. Add the confusion of one way streets and other traffic restrictions, and the streets start to seem much crazier than they actually are. Been there, done that. Driven down many a one-way street the wrong way including Boylston once, rofl. It was late at night and empty, so I got lucky and was able to pull a 3 point turn and go the correct way. The amount of one way streets is horrible, especially as you said, around the common. Why do all the streets go the same way!? !